Getting engaged and planning a wedding is an amazing experience! With the cost of having a wedding in your hometown on the rise, many couples are opting to create an experience for their wedding party and guests by choosing a Destination Wedding. A Destination Wedding has all the elements of a traditional wedding; emotional vows, beautiful wedding cake, unique bridal gown, handsome tuxedos; coupled with a honeymoon location and vacation for guests! Many of the Destination Weddings that take place at all inclusive resorts also offer free or significantly reduced wedding packages (depending on the extras you want) when a set number of rooms are reserved by your wedding party and guests. Choosing a Destination Wedding planner is the first step on the process. Choose a travel agency who has had years of experience in planning such special events and has been to many if not most of the places you’d like to consider as well as a vast knowledge of the all inclusive resorts. Now that you’re decided that a Destination Wedding is for you, these are the Top 10 locations for a Destination Wedding. Choose one that suits your style and personality. Each one of these locations has much to offer a wedding party and a memorable honeymoon as well! Located in the center of the Caribbean, engaged couples who choose Jamaica do so for the weather, the temperature is the same all year round, the sugar sand beaches, the music, the beautiful reefs (for scuba or skin diving), the history, the shopping and the variety of all inclusive resorts to choose from. If you are looking for a free wedding, choose an all inclusive location in Montego Bay, Negril or Ocho Rios! Located along the Caribbean coast of Mexico’s Yucatan Peninsula, The Riviera Maya is a modern venue to host a destination wedding! Couples searching for a destination wedding choose Riviera Maya as it offers high end luxury accommodations, outstanding dining, a vibrant nightlife, shopping, golf, swimming, snorkeling, scuba diving at the largest coral reef in the northern hemisphere, and of, yes, some of the most beautiful white sand beaches in the world! Free Destination wedding packages are also available in Riviera Maya as well as packages to suit many budget. This is also an easy location for wedding party members and guests to travel to! 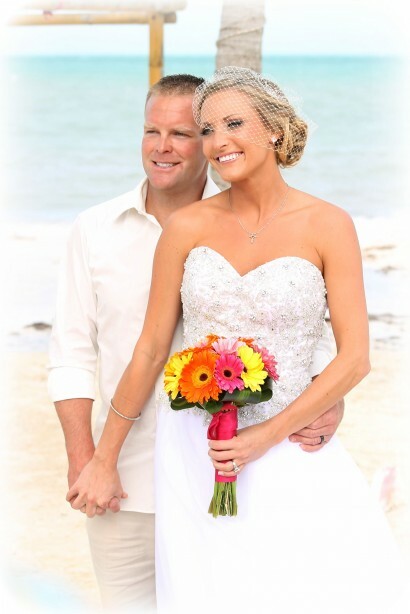 Known as a Destination for Spring Break, Cancun is also for weddings! This destination wedding location is in Southeastern Mexico on the northeast coast of the Yucatan Peninsula, and situated on the Caribbean Sea. Couples wanting to marry in Cancun choose this location for the powdery, white sand beaches and beautiful blue ocean views. Couples enjoy water sports, upscale shopping, and duty free shopping and dolphin encounters. With an energetic nightlife, clubs, bars and restaurants, an active honeymoon and vacation for your wedding guests is sure to create great photos and memories for everyone. Your all inclusive wedding in Cancun will be the perfect for you! Looking for a beach wedding in the Caribbean? The Dominican Republic could be the place for you to start a new chapter beginning with a destination wedding! The DR has all inclusive resorts to fit many budgets as well as choices for family-friendly or adult only resorts. Looking for rest and relaxation? Choose the Dominica Republic with its silky white sand beaches and coconut palms lining the ocean. Need a little more excitement? Choose an off road safari, a zip line tour, parks, casinos and buffet or a-la-carte dining. The DR also offers free wedding packages at several all inclusive resorts in Santo Domingo, Puerto Plata, La Romana or the popular Punta Cana! With a slogan like, It’s better in the Bahamas” you know a destination wedding for you and your guests will be a wonderful experience in any of the islands The Bahamas has to offer. Planning a destination wedding in The Bahamas is made easier when you enlist the help of a destination wedding travel agent. The Bahamas boasts some of the best beaches in the world including the famous Treasure Cay Beach in The Abacos. You’ll find the waters to be a perfect 80 degrees year round. You and your wedding party will enjoy the excellent dining, ecotourism, diving, private flying, fishing sightseeing and the beautiful beaches! Looking for a perfect all inclusive resort for your wedding? The Sandals Royal Bahamian in Nassau has one of the best beaches in The Bahamas! Getting married is a decision that two people make. Planning a destination wedding should involve one more person: a destination wedding expert who can help you make decisions based on your budget, your wedding party, guests and what kind of experience you want to have. Trust Enchanted Honeymoons Travel. They are the destination wedding and honeymoons wedding experts! They work with couples over the phone or in person to ensure that your wedding is as perfect as your love is. They take care of all the details of planning a wedding to an exotic location. From the flowers to the cake and the rehearsal to the celebration dinner and honeymoon, trust the destination wedding experts who have been to the places you want to go to and who plan over 500 weddings a year!